Mayor Steve Leary and Commissioner Greg Seidel met early the morning of November 29 to discuss where they stand on electrical undergrounding, a connectivity plan for city greenspace, traffic management and the possibility of forming an architectural review board. The meeting was called by Commissioner Seidel, who sought commonality and support from Mayor Leary for more systematic planning on these issues. Seidel expressed his feeling that the City needs more detailed designs against which to measure its progress. The discussion, which lasted approximately an hour and a half, was often detailed and technical. We have included video of the meeting in its entirety to enable readers to judge for themselves where and when Leary and Seidel were able to find common ground. Leary doesn’t like details. Keep voting for Mr. Feel Good though! Has anyone noticed how stressed out Leary seems to be lately? Because Leary on the video seems not particularly interested in any of the important civic matters Seidel has raised, I wonder if Leary agreed to the meeting in hopes that it would appease Seidel enough that Seidel would not challenge Leary for mayor in 2018. Seidel has all the right stuff to replace Leary if he so chooses to run in 2018, having recently won two back to back City Commission elections soundly against better funded opponents. That may be what has Leary all in a tizzy. Could someone please check Leary’s blood pressure? He doesn’t look well. Did you see Leary at 1:13 on the video crushing his plastic water bottle very close to his microphone? I heard this really weird, and really loud crackling noise when I was watching the video, so I backed it up a couple minutes to find out what it was, and sure enough, there was Leary, after he angrily denied several times controlling the City Commission meeting agenda, literally crushing his plastic water bottle from top to bottom and from bottom to top simultaneously. I’ve never seen anyone do this. Isn’t that kind of weird to be doing in the middle of a public City meeting? 3 anonymous comments meant to harm and discredit someone. Small town politics at its worst. I thought WP was better than this. I don’t see any harm meant. The people commenting seem concerned and caring. Had they said “Why isn’t Mayor Leary wearing any socks? What does he think this is, the beach?” OR “Mayor Leary looks like he’s been to too many campaign dinner fundraisers” OR “Why does Mayor Leary keep stroking his beard? Does he think that will make it grow faster?” Those would be comments that are completely irrelevant to the very important qualities of leadership, that every Winter Park voter values – one’s demeanor, temperament, and caring. But those were not the comments made. Instead the comments addressed rather concerning leadership blunders. Winter Park needs a mayor who demonstrates civility at all times. Winter Park needs a mayor who demonstrates that he cares about the residents. Winter Park needs a mayor who is interested and engaged about the matters of most concern to residents, and who vigorously goes about resolving those issues to everyone’s satisfaction. I think everyone would agree with that. An hour and thirty minute video of Leary, and a week later Leary’s supporters still don’t have anything positive to say about Leary here in the comments? This does not bode well for Leary’s re-election campaign. It’s hard to win elections by tossing barbs at concerned citizens. You can spin it however you want. But it’s rather transparent that an attempt is being made to distract from Leary’s embarrassing performance by insinuating that the citizens who brought it to our attention are not nice people. Our Commission Pledges to Deliver: Have You Been Served? We lack planning, vision, and updated masterplans. Many of Winter Park’s best efforts exist as documents that sit on the shelf gathering dust. We’ve spent $50-$70,000 on a masterplan for Martin Luther King Park that completely missed the mark. What logical planning steps were missing that could have anticipated a better result? Winter Park is a community of 30,000 people, or 11,000 households. When was the last time you received a citizen-survey on key issues. It’s easy enough these days with digital platforms like Survey-Monkey. Why not make this an annual or semi-annual event? The investment is worth it. Here’s a short list of questions for our city commission. Why has undergrounding slipped from a target of 2020 to 2026? How many commissioners live on streets that have already been undergrounded? Why will many of us have to wait for nine more hurricane seasons to see our streets undergrounded? Is it worth the risk (and expense) to endure not three, not four, but nine more hurricane seasons? Why has the library size gone from 50,000 s.f. to 34,000 s.f. to 39,000 s.f. with no explanation? Who is making these decisions? The same could be said of the parking structure — here one day, gone the next. How will Morse Boulevard accommodate the new traffic patterns? Traffic management lies at the core of the number-one citizen complaint. Why do we have no traffic modeling in place to serve as the baseline to drive the search for solutions? Future parks land acquisition is paramount. What properties are on our target acquisition list? What is the timeline? How can private citizens help? Why has the CRA seemingly abandoned its efforts to make the 17-92/Fairbanks intersection a thriving and dynamic Gateway feature, a Winter Park priority since before the mid-90s? Is there a perception among city staff and elected officials that some voters are more equal than others? Why is there no better evidence of decision-making? Repeated lack of transparency in decision-making is not just the result of a few bad apples — it’s infected the orchard. If answers to these questions are not forthcoming, why not? As citizens of Winter Park, have we been served? 1. The City seems to be rushing into a new project (the Library / Event Center) before a clear plan to complete previous projects (i.e. undergrounding). We, on back or side streets, can not plant the oaks and other long term trees until the above ground lines are removed. Get one job finished before jumping to another one. 2. The new facility was sold as a library project but, in studying details, it sounds as if the Library is just a front for getting funds for an elaborate event center. It seems that the people may have been misled. 3. In this time and age, the word “LIBRARY” needs to be redefined. Centuries past, a library was an available collection of printed books; particularly as an archive of knowledge not readily available elsewhere. Today, with the Internet, not only are those volumes more accessible; but the time to do research is minimal compared to ”read and search”print. Universities, and other institutions, are shrinking the size of their “printed research book” section and expanding computer terminal availability. WHEN LOOKNG AHEAD SEVERAL DECADES, ARE WE GOING THE WRONG DIRECTION? 1) An undergrounding plan by previous and current commissions is to pay for undergrounding out of cash flow from system. All commissions have voted to proceed this way as a careful and conservative plan. If revenues decline, plan slows down. Vice versa. 2) Referendum language and Ballot language mentioned library and events center. 3) Internet is creating more library use. lots of data on library website. The direction is right. Just my .02. Seidel has shown twice before that he can defeat candidates that appear initially to be stronger in many ways. 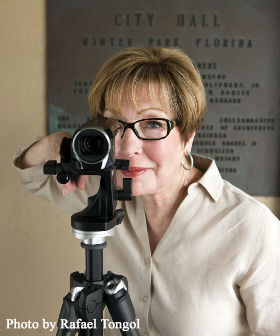 Will Seidel attempt three in a row with a one on one challenge to Leary for the top political job in Winter Park? We will find out in January 2018. Meanwhile this video has gone viral. It already ranks similarly to many of the prior WP candidate debates on YouTube. Pass it on to a friend in Winter Park.